The Princess Fairy castle is any little fairies’ dream castle. The Princess Fairy Castle is a 3 in One castle. 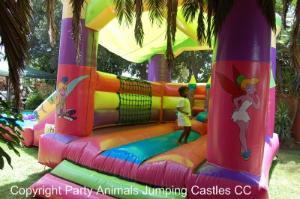 Jumping Castle with a roof, slide and ball pond. The little princess chair one the inside is a added bonus and little girls and boys love this little chair. They will even compete to sit on it! The roof provides welcome shade in the heat of the day and protects kids against sun burn. The slide extends from the top wall, so it is nice and steep. They climb a cargo net on the inside of the castle to be able to go onto the slide. The slide has inflatable walls on the side that ensures they cannot fall off. This adds to the safety of the slide. The ball pit can be filled with “coloured fun balls”. These are rented separately and there is +-200 balls per bag. The Princess Fairy does have a larger pond than most other castles, which makes it real fun for the smaller kids. Dimensions: 5m in width and 8m in length. Colours: Lime Green, Cream, Pink, Purple and Spec Blue. The castle has art work in the Fairy theme, but this does not limit it to a fairy party only. This castle can go with any girly theme! The Motor is a 1.1kw motor with a 15m extension lead. If your power point is further than 15m from where the castle will be placed, you will need to supply an additional extension lead. These are not provided by Party Animals.